When you are first trying to decide how to start homeschooling and putting your curriculum together, you are probably thinking about the more formal subjects such as math or languages. But there are many useful and valuable lessons that can be learnt from teaching skills to your children. Giving your kids cooking lessons as part of your homeschooling program can introduce them to a wide range of disciplines - and bring math to life! There are many ways you could introduce your children to cook - it is probably something that happens a lot in your household anyway! Even just getting them to help you prepare a meal now and again is a good start. As well as day to day tasks, there are lots of opportunities to introduce food and cooking via other subjects you may be studying. If you are studying a period of history, why not investigate what they cooked and ate? This can really bring a topic to life for your children. Geography offers lots of opportunities for cooking and eating international recipes. 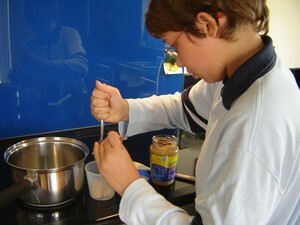 Even science needn't be missed - there are lots of food science experiments you can try. Take some time to look for opportunities to add homeschool cooking ideas within your current curriculum as well as making time for it as a subject on its own. Before you start, have a think about exactly what you would like to achieve in teaching your children how to cook. Are you wanting to simply give them a useful skill for life? Or do you want to take things a bit further? Homeschool cooking in the curriculum could include many related topics such as nutrition, food safety, the digestive system, or even cultural awareness. Would you like them to be able to cook for friends, or become renowned for their sumptuous desserts? Or would you like them to be confident in the kitchen enough to take any recipe and make it their own? Remember to take into account your children's own interests and skill levels too. My daughter has never been much interested in food and dislikes working in the kitchen. But she loves her dogs and stepped up to baking home-made dog treats with enthusiasm and relish! Understanding exactly what you want to achieve will help you set homeschooling goals that you can work towards. Be adventurous. Even if you can barely boil an egg, you can still work with your children to study and achieve skills together. But do be realistic in your expectations. If you are a klutz in the kitchen - or your children are still small - then it is going to take more than a few weeks to achieve kitchen competency! Break your goals into steps. What skills will you need to teach to help your children? Food preparation? How to roll pastry? The best way to break an egg? If you don't have those skills yourself then take some time to research them so you can confidently lead your children through them. Find specific recipes that will use the skills you want to teach and work towards your goals. If this all sounds too much, then why not start with the kids cooking lessons on this site it is perfect to use in homeschool cooking! Now you have a break down of your lessons, decide how you would like to accomplish them on a day to day, week to week basis. We have a very relaxed homeschool schedule and tend not to plan out a specific timetable. But I do try to make time for working in the kitchen at least once a week. The key to success with this method is to be organized enough to spontaneously suggest it! As I explain in my free homeschool planner e-book, I plan and organize everything for a session first. So once I have decided on a recipe I gather all the ingredients together and plan out the skills we will cover. Getting everything together first will be key to your success. You may THINK you know what you are going to do - but unless you have fully prepared (by printing out the recipe and pulling together the ingredients), then you may just stumble at the first hurdle. Once I am totally prepared then I add that lesson to my 'green for go' list! And then I can announce 'lets do cooking' whenever we have a quiet moment. This type of planned spontaneity works very well for us. Not for you? No problem! 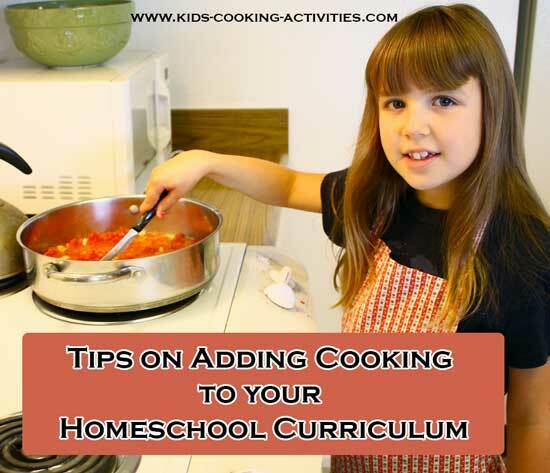 Just schedule your cooking lessons in your homeschool curriculum planner as if they were any other subject. I am sure that once you begin to include homeschool cooking lessons in your curriculum, then you will really reap the rewards. Children that are confident in the kitchen are often more confident overall. It can be a very simple thing - once my children could make themselves a sandwich and pour themselves a glass of milk they felt they could take care of themselves. My clingy son relaxed and stopped worrying so much about me not being there all the time. Cooking is a part of who we are. It is science AND math AND geography AND culture. Teaching cooking gives a rounded education that reinforces and affirms so many other subjects - not to mention all that weighing and measuring! It brings history alive. It gives you a taste of other cultures. And best of all - it's fun! See all the benefits of what kids learn while cooking.